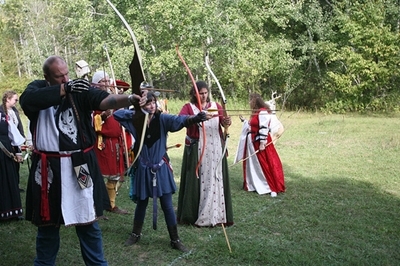 One of the many activities you can participate in the SCA is Archery. 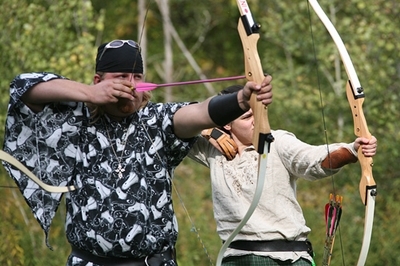 There are two different classes: Combat Archery and Target Archery. 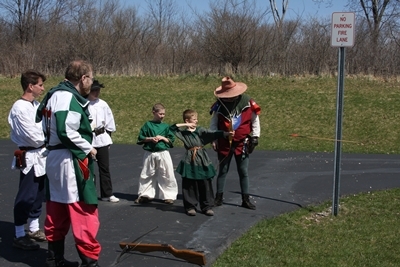 Combat archery is used in conjunction with field combat in battle situations. 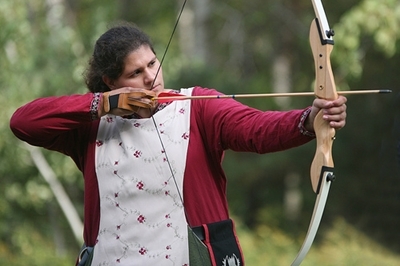 This requires restrictions on power or poundage of the recurve bow, and arrows of a safe design to hit men in armor. 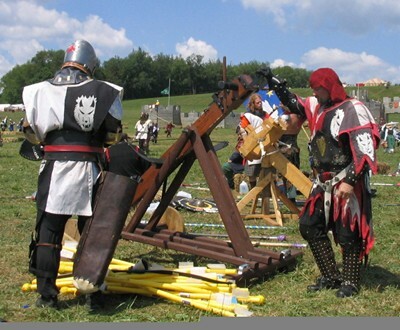 Trebuchets, ballistas, and catapults are included in this class. Here are pictures of ballistas. For more, go to http://www.sca.org/officers/marshal/combat/c_archery/. Target archery is used for battle points in many of the "wars", as well as for fun by the participants. Archery shoots can be as simple as lining up and shooting at a target with the highest score being the winner, to various novelty shoots. 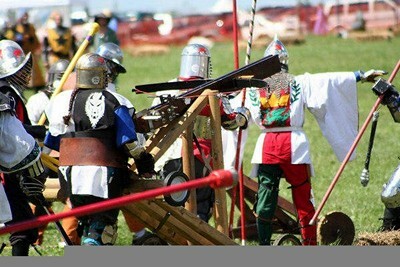 A very short list of novelties includes storming the castle, defending the castle, tower shoots, War of the Roses, duck-goose!, friend-foe, berserker, York, modified York. The archery link below can bring you to links with these and other shoots listed in greater detail. These are pictures from the White Stag competition held by the Company of the Ironwolf. 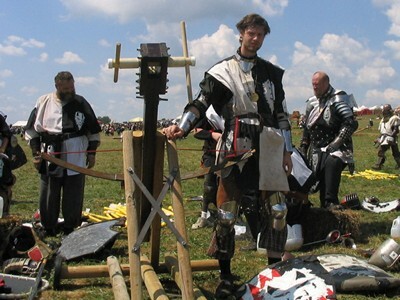 Sir Osric Eisenwulf, Knight of the SCA and head of the Company of the Ironwolf is in the first picture on the right side of the picture giving instruction to the archers on the rules of the tournament. Bryn Archer is in white (having just fired her shot) in the second picture with the ultimate winner of the competition in the foreground - George (ready to release his shot), and Lady Saehilder is in the fourth (ready to fire). 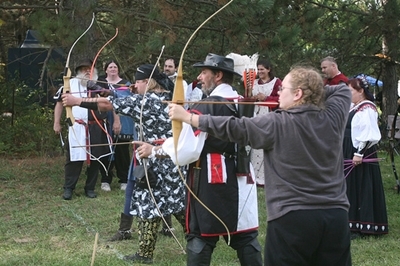 For more on Archery in the Middle Kingdom, go to http://www.sca.org/officers/marshal/combat/c_archery/.